To the Ferrari purists out there who expressed some dismay that the new performance version of the 488 GTB would use the “GTO” moniker, relax: It seems like the car will be called the 488 Pista instead, according to these leaked press images. Update: Yep, it’s official now. Update, Feb. 20 9:41 p.m.: Ferrari finally dropped some details of what’s officially called the 488 Pista. The latest special series car reaches max power at 711 horsepower and 8,000 rpm from the company’s most powerful V8 ever, with aero and styling work inspired by the company’s F1 and GTE cars. Dry weight comes in at just over 2,820 pounds, and the Ferrari claims the car has a top speed of over 211 mph. The original images in this post have been replaced with official Ferrari images. The rest of the original article continues below. 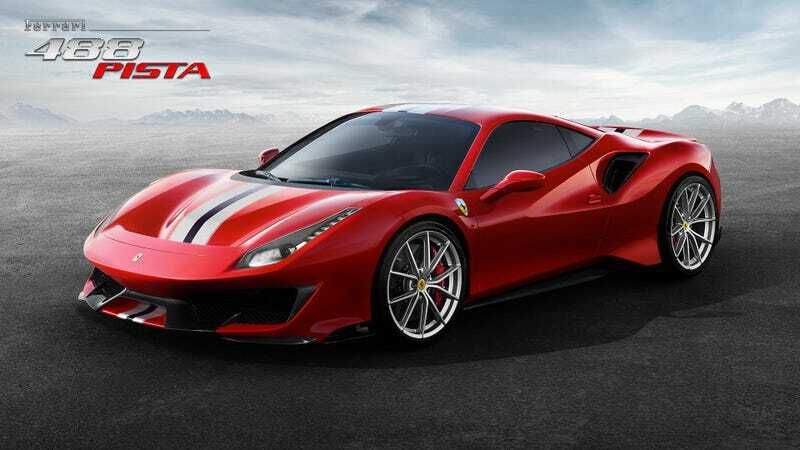 The images, scooped up by Ferrari Photo Page, show the striped and aggressively aeroed 488 variant with the name “Pista” stamped across its rear. “Pista,” which means “track” in Italian, seems like a fitting fast car-ish sounding word that Ferrari would use for the sportier model. Motor Authority reports it has 711 horsepower and 568 lb-ft of torque from its 3.9-liter twin-turbo V8, but we’ll know for sure when the car officially debuts. The site also claims it drops about 200 pounds from the regular 488, putting it at a healthy 2,821 pounds. If these truly are the official press photos, then you can see how many more holes, vents and scoops that Ferrari has cut into the car. All in the name of gluing the car to the tarmac better by using air. We have reached out to Ferrari for comment on the matter and will update if we hear back.